Blind students enjoyed a day of running, throwing and kicking as the Redemptorist School for the Blind organized its annual sports day. 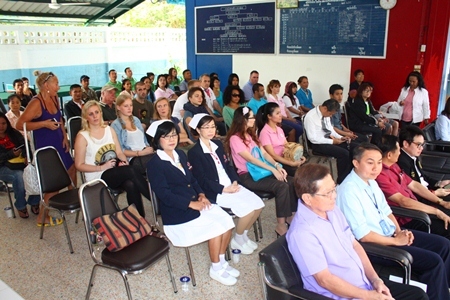 Pattaya City Councilman Rattanachai Sutidechanai opened the Feb. 14 event with Phanom Rodiem of the Social Development and Human Stability Ministry and top Father Ray Foundation executives attending. 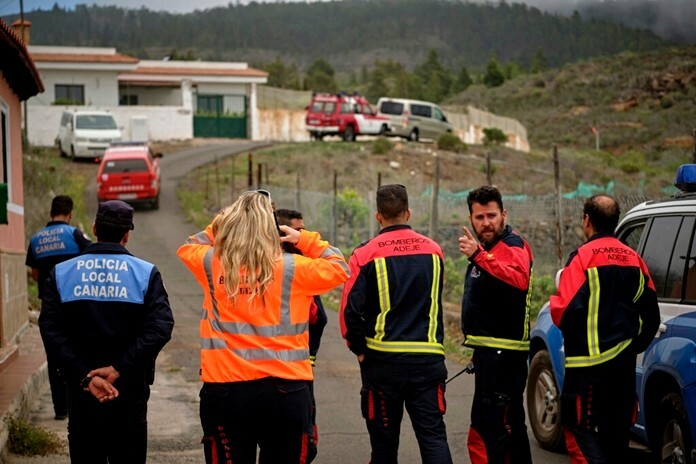 Events included solo and relay races, walking on shells, petanque and goal ball. 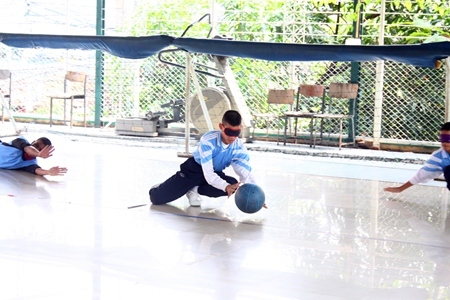 The day was intended primarily as fun and exercise, but traditionally has helped the school perform well at international disabled-sports competitions. 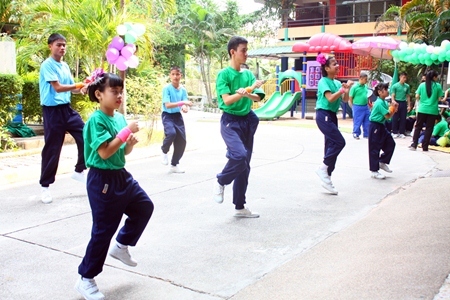 School Principal Aurora Sribuaphan said sports day was first organized in 1993 and, since then, many students have gone on to win awards in various competitions. Pattaya city councilman Rattanachai Suthidechanai, chairman of Pattaya’s sports and tourism department, strikes the gong to officially open this year’s sports day. The day began with students parading to a music performance and teams outfitted in green and blue marching onto the field for a “Gangnam Style” show. After the ceremony, Rattanachai joined in at a game of table tennis. 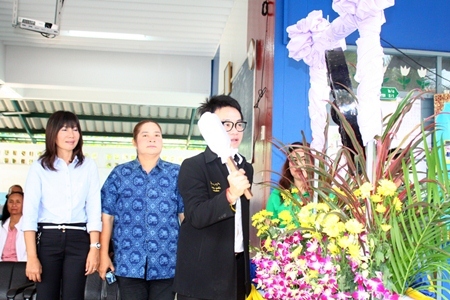 Suphamit Srikanthamakul, deputy director of the Chonburi Office of Primary Education Region 3, blessed students during a closing ceremony. 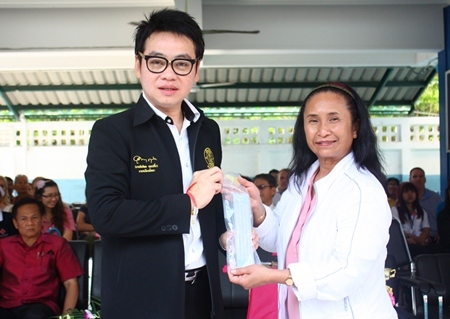 Bunlai Vankhula (right), from the Thammasart Association of California, presents a slate and stylus to Pattaya councilman Rattanachai Suthidechanai to distribute to the children for learning how to write Braille. 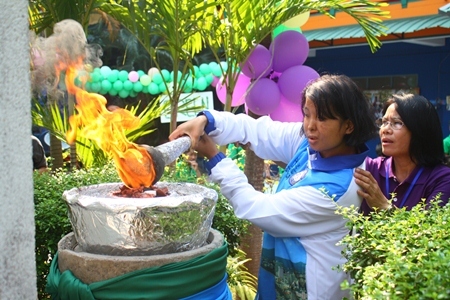 Kanyarat Ruangwicha lights the flame signifying the beginning of this year’s sports day at the Pattaya Redemptorist School for the Blind. 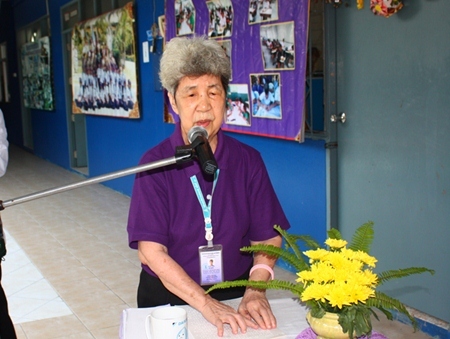 Aurora Sribuaphan, director of Pattaya Redemptorist School for the Blind, welcomes one and all to the 2013 school sports day. The blue team enters the sporting arena at the head of the opening ceremony parade. 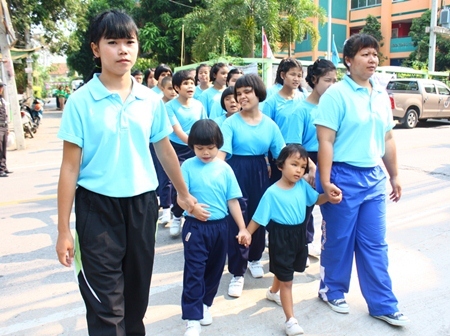 Blind children at the school get caught up in the Gangnam style dance craze. Blue team cheerleaders sing the team’s cheer song. Father Patcharapol Srivorakul, acting president of the Father Ray Foundation, presents medals to the blue team. 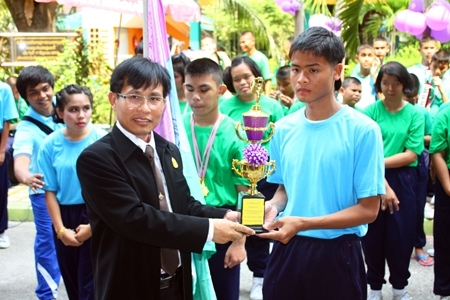 Suphamit Srikanthamakul, deputy director of the Chonburi Office of Primary Education Region 3, presents the winning cup to the blue team. The green team defends their goal during the goal ball competition, and go on to win with 24 points. Young girls enjoy running the relay race. 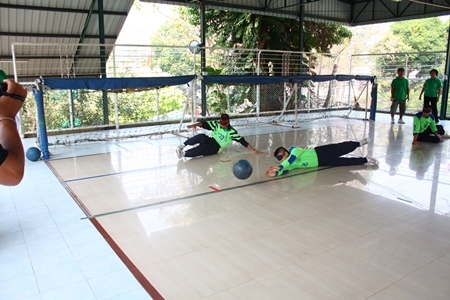 The blue team makes a save during the goal ball match vs the green team. A referee marks the time as a green team coconut shell runner crosses the finish line. One of the green team’s cheerleaders flashes a beautiful smile during her team’s dance. City councilman Rattanachai Suthidechanai tries his hand at table tennis with a blind student. 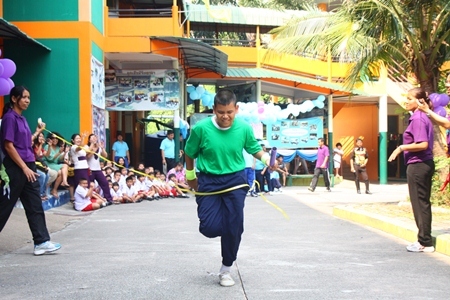 A green team runner crosses the finish line in the male relay race. Sponsors and volunteers take part in the opening ceremony activities. 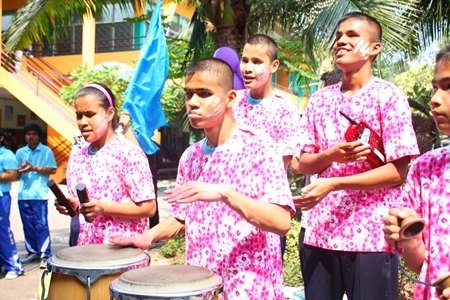 Blue team cheerleaders bang the conga drums to cheer on their teammates.